EVERYDAY EMERGENCY ESSENTIAL | Small, lightweight and delivers 8+ hours of dependable bright light to ensure you're not left in the dark...literally! 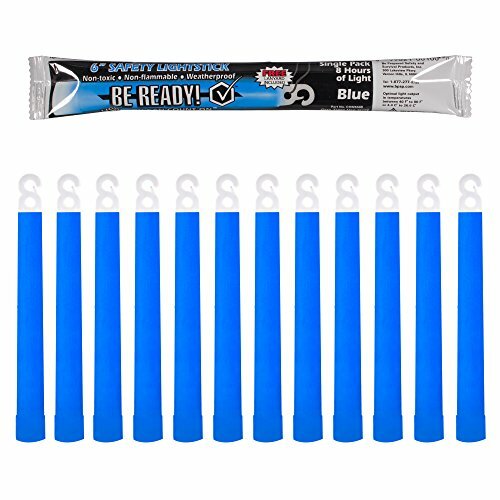 TACTICAL TOOL | From roadside assistance to help on a hike, everyone from first responders to families rely on these 6" waterproof glow sticks. INDUSTRIAL /COMMERCIAL GRADE | We supply these INDUSTRIAL glow sticks to Government agencies, Emergency kit suppliers and to anyone who needs reliable, bright emergency illumination at the snap of a finger. SMART STOCK UP | Outfit your survival & first-aid kits, toolboxes, and vehicles (including boats & bikes) with these illuminating little life savers, and give as gifts to those you want to keep safe. LONG SHELF LIFE | Safety sticks can be stored unused for up to 5 years, and are available in red, orange, yellow, blue, green and white. No batteries required!